Yep, I'm feeling pretty jolly right about now. This feeling has nothing to do with the mulled wine I consumed a few hours ago or the vast quantities of cookies I devoured. Honest! 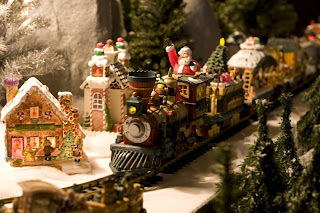 Rather I feel content knowing that we are spending time with family, enjoying the excitement of our children's anticipation of Christmas day and finally realizing that there is nothing left to do other than play Santa Claus. I have tried to keep this holiday season fairly low key. 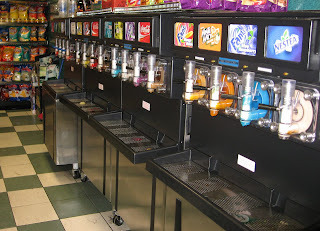 I haven't spent hours in crowded malls, felt the pressure to create a perfectly decorated home, nor have I found myself staying up late to ice that last batch of mocha frosted drops. I did fail to find a pink horsey for my lil bug (mainly because I decided to pass on buying into the mass marketed my little pony or large stuffed unicorns). Hopefully the cute brown stuffed Ty Beanie baby horse along with a horse book will be a sufficient substitute. Despite my attempts to be calm and relaxed I have had my testy moments with the kids and my spouse at times. I have lost my patience and have been pretty tough on my monkey boy. Hopefully he and I can weather through our battle of wills and continue to find special snuggle times to help us through his growth in independence and bossy tendencies. I honestly tried to keep up my family advent calendar. The days however started to blend and like any good cookie were quickly consumed in a brief memorable moment of pleasure. The last days of our family advent calendar were filled with decorating sugar cookies, creating tree decorations, tobogganing down a small hill at the farm, having a bubble bath and making a play fort/castle/house using a table and old bedding. Other than our trip to Heritage Park and our family snowball fight, the highlight event from the advent calendar was trimming the tree we had chopped down from a stretch of forest in the foothills west of my in-laws homestead. Thankfully our tree-hunting expedition took place in late November since the last few days have been bitterly cold (as in -25 degrees celsius with a windchill of -30 or so) and there is no way I wanted to be in isolated country hunting the roadside for a suitable specimen to drag home. Today was fun. A chinook wind blew in stirring up the snow, causing blustery conditions on the roads but heralding warmer temperatures. We managed to go outside twice today. 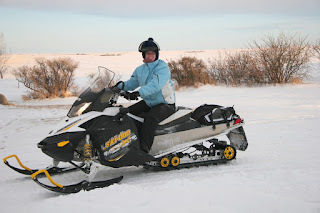 The second time provided an opportunity to ride my father-in-law's new snowmobile. It was so much fun!! I love speed! Monkey boy went on a quick run with J and lil bug ventured out with her grandpa (who can do no wrong). We had a nice super of chicken wings, rice, broccoli, veggies and dip and sweets. 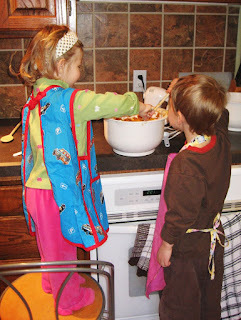 The kids had a great time playing kitchen. My father-in-law drew a stove top onto a large box and my mother-in-law located a vast array of kid's cups, saucers, and other various kitchen paraphernalia for them to use. We ended the day with setting out a cup of water and orange for Santa as well as 8 slices of apple for the reindeer. The kids received matching monster truck pajamas from their grandparents and crawled into bed, excited but not overly bursting at the seams. I have laryngitis. It started Friday afternoon along with a monster headache and it has only been in the last few hours that I can talk above a whisper. It has been a challenge to reign myself in from commenting on my children's play, behaviour and squabbles. Perhaps it is a good lesson to use my words a little more wisely and efficiently (at least in the verbal realm, as we all know I can't stop my overzealous use of words in my writing). Now laryngitis shouldn't have put a stop to my creating family memories in our lead up to Christmas but combined with -21 to -27 degree celsius weather, I decided to forego the outing to view the Christmas lights display on 14th Ave near Confederation Park. I also lost any desire to go on a shopping trip to purchase birdseed and then create a feeder with the kids. I really just did not have it in me to be any more ambitious than wasting some time at the nearby Chapters on Saturday or to venture outside and play for 10 minutes today. I did manage to finish most of my Christmas cards. J put together a great picture collage of the kids combined with some witty text. I will hold off posting the card here as I am sending the card to the one or two readers that check out my blog (sometimes surprises can be nice). I still need to make some pistachio cocoa nib cookies and sugar cookies. I am stalling on making my famous (per my fellow co-workers opinion poll) sugar cookies (the secret is in the icing) until we go to my in-laws. My mom-in-law is the sugar cookie expert and loves to get the kids to help bake and decorate. So hopefully this case of laryngitis is on the way out the door as the countdown to Christmas quickly evaporates into thin air. I'm just glad that the only shopping that I have left is for my husband...though this may prove to be the most difficult task I have left on my to do list. On Day 11, lil bug was thankfully napping away her grumpiness, so monkey boy and I found some time to work with on a pre-packaged foamy project. Personally, I'm a pretty crafty kind of gal. Heck I made over 100 place settings of tiny flower pots filled with plaster in order to support a hand crafted wire spiral which in turn held a paper flower printed with a quote for our wedding day. A little over zealous on my part but my roomate at the time helped with finishing it as well as finding time to mock me in a good natured way. However, I now have 2 kids under 5 years of age. I don't have the luxury or desire to develop my own craft idea, purchase the supplies, or be patient with setting it up. I have grown to like the instant kits, especially when they involve foamy pieces with adhesive already on the back. The downfall is sometimes they don't always stick but a little glue or willingness to try another one seems to solve that problem. So monkey boy and I created some Christmas trees. He found it very amusing that we were making Christmas trees for the Christmas tree. I love the fact that he is starting to see the humour in life's little things. 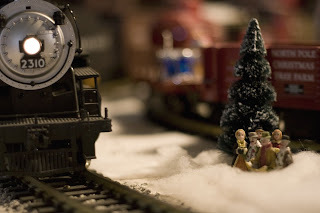 Day 12 of our family advent calendar focused on decorating again. This time with lil bug. I have fortunately re-connected with a friend (my birthday twin) from my college days. She has two children as well and we are both recent Calgary inhabitants. We have been trying to get together with our youngest kids on a regular basis while the older ones are in school or pre-school. Yesterday she arranged for us to have the kids decorate gingerbread cookies. After lil bug overcame her shyness and indignation over going somewhere she thought she didn't want to go, we had a good time watching them paint their cookies and eat their way through candies. Lil bug's final assessment was "that wuz fun". Day 9: Donated toy to Salvation Army toy drive; this was such a great opportunity to teach the importance of giving even if it is to "someone we don't know". Monkey boy picked out a John Deere excavator because he thought someone would like to play with it and because it wasn't too big or too small. I was so proud of him when he placed the toy into the donation box and truly listened to my words about donating. 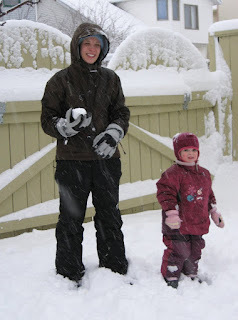 Day 7 of our countdown to Christmas found us having a family snowball fight (impromptu). Big fluffy flakes floated down from the sky. It was a perfect day for snowballs. My sister and her kids had decided to drive down to Calgary to spend the day (there was no snow in her part of the province, a mere 150+ km north). 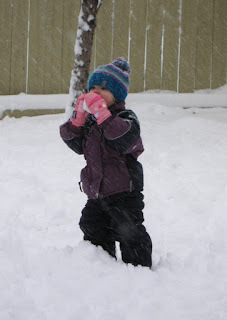 After lil bug's nap, we hustled over to the grandparent house and delved into a fantastic family snowball fight. 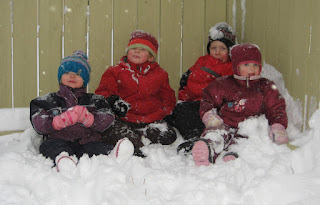 The boys delighted in socking their parents and grandparents with snow. The girls attempted to hold their own though lil bug discovered that snowballs are good eating and proceeded to devour two or three while the snow flied around her. 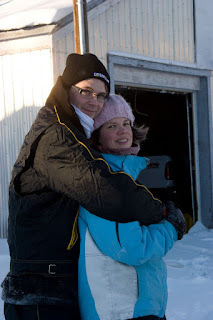 The adults found their inner child and enjoyed plowing each other with a barrage of snowballs. J thought it was a hoot to stuff snow down my pants as I took pictures. Someday I will pay him back. Day 6 of our family advent calendar took us to Heritage Park and their seasonal event, Once upon a Christmas. 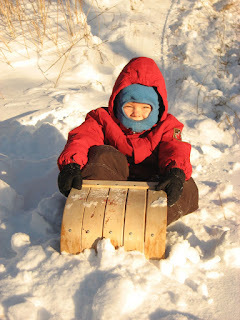 Perfect day, happy kids, happier parents, mild weather, fun activities, great escape. 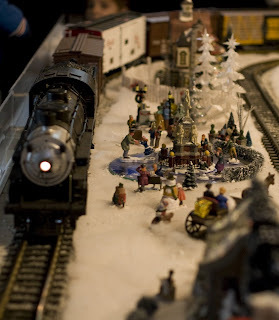 model trains - have I mentioned that both my kids LOVE trains and they easily spent 30+ minutes watching them go around the tracks waiting for their favourites to reappear. gingerbread people decorating - icing and sprinkles everywhere! candy store - they each picked out a candy to try. 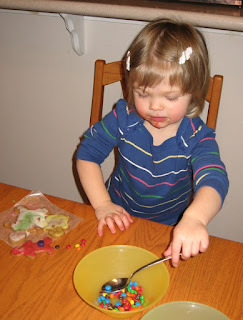 Monkey boy wanted gummy bears, lil bug chose gum drops. The gum drops were quickly spit out by both parties but monkey loved the gummy bears. straw fort - this was a little anti-climatic as there were probably only 15 bales placed in a loose rectangle shape but they loved to run atop them nonetheless. Victorian decorated homes - one of the homes I use to work in as an exhibit interpreter was open. It didn't take long for me to lapse into my spiel on the place...egad how long will useless historical facts persist to take up space in my brain. 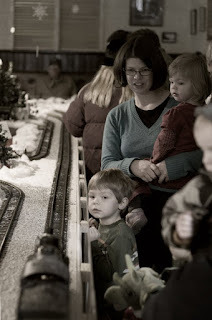 wagon rides - they were fun to watch and held the kids attention but we passed on taking one due to large crowds. Lil bug managed to pet one of the Belgians and loved it, of course. We capped the morning off with lunch out at a coffee shop/cafe (similar to Bridgehead or Wild Oats in Ottawa but a little more commercial in feel). Finally we piled into our house and beds at 1:45pm and we all slept soundly to 3:30pm. I guess the fresh air, exercise and excitement wore us out. It truly was a great morning! Day 3: Letters to Santa. It was a bit of a struggle to build my kid's enthusiasm for this activity. I definitely need to work on my advertising pitch and perfecting my timing of activities a bit more for my two munchkins. Nonetheless as a grumpy momma I plowed through with the idea, prompting them to provide me with the contents of the letter. Thankfully, they seemed to enjoy decorating the cards with stickers and foamy pieces. My name is *. I am 2 years old. I want a horsey for Christmas, a pink horsey. My name is *. I am four. I'm going to be at Grandpa and Grandma's for Christmas. I'm going to leave a snack for your reindeer in the snow by the apple tree. Could you bring me a present for Christmas? I would like a Ming-Ming the Wonder Pet stuffed animal and a car that lights up but no sounds. Day 4: Pick out Christmas books at the library for us to read. As always the library continues to be a favourite outing for the kids. The Christmas selection of books at our library was significantly picked over. Everyone must have had the same idea as myself. The three bays of shelving held a scant 15 books. We came home with four and so far the favourite is Spot's Magical Christmas (not necessarily my first choice). 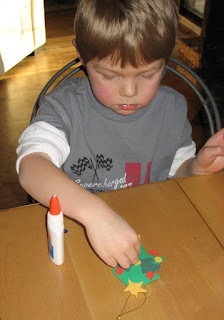 I chose to dig out this activity to keep us busy during that restless witching hour before dinner arrives on the table. Thankfully J was home to help...he chose to make dinner (mainly so he wouldn't have to agonize over the mess the kids would undoubtedly create). The kids donned their smocks/aprons and plastered a couple of wooden ornaments with paints. My kids are free spirits when it comes to crafts. I have really tried not to put parameters on where or in what manner to paint, colour or draw. Yet tonight a little assistance was needed. I wiped off monkey boy's first attempt at painting the ornament when I realized he was just using it as a palette for mixing colours. We then worked together to sort-of paint in the lines. Lil bug patiently put up with my holding her hand to paint but was delighted when she could just freehand paint on paper and play in the water bowl. After a period of soaking the newspaper with water and getting paint up to their elbows, we put the paints away for another day. This was a great activity. Both the kids and I had fun just being creative and messy. A friend of mine, Karen, pointed me in the direction of a delightful blog, A peek inside the fishbowl, by a fellow Ottawanian. I was inspired to organize my December calendar after reading her 25 days of Christmas challenge. My calendar is now officially loaded with a fun activity for each and everyday, though I have yet to create funky envelopes to hold the day's events. Thankfully I brought out my fabric advent calendar with the tiny pockets I like to fill with stickers, cars and odd ball dollar store items. Monkey boy and lil bug receive instant gratification with counting down the days on our advent calendar and I know that I have something extra up my sleeve for their day. I started the countdown to Christmas off with a bang. 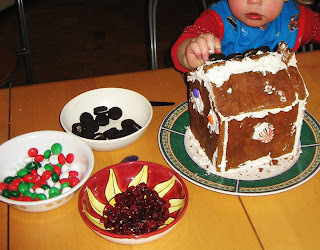 Day 1 and 2 were occupied with creating a gingerbread house. 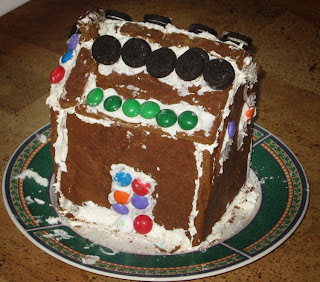 As kids, my sister and I rarely received a gingerbread house kit. If memory serves me correctly, I think the few we tried were pretty awful looking or never structural sound. Yet I felt ambitious this year. 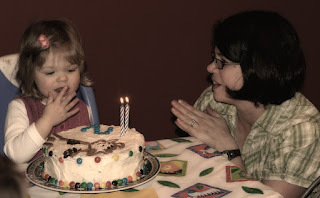 I'm not working, I have a desire to create and bake, and I want to share special moments with my kids. 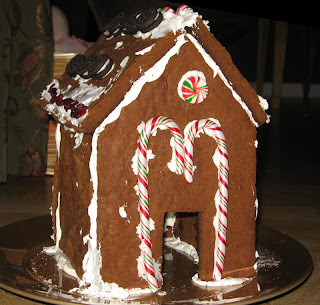 So I figured how hard could it be to make a gingerbread house from scratch. I poked around the internet for directions, recipes and templates. I meshed some information together and decided to plow headfirst into the project. The kids helped me prepare the dough. 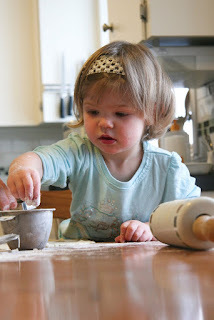 It was a hoot to see them mixing the enormous pile of dough. Monkey boy's running commentary regarding texture and colour kept me entertained. The only glitch was the dough was too dry. I knew I couldn't roll it out, there was absolutely no way it would stick together. I had this huge mound of dough (the recipe called for 9 cups of flour) and I wasn't about to start over again or let it go to waste. Crap what should I do? Well, call my mom of course. With rolling pin in hand (our rental place was devoid of one), my mom came over, suggested I try adding milk in small batches while she occupied the kids. It worked enough for me to roll out the dough on a cookie sheet and have it more or less stick together. After the kids were in bed, I cut out the house shape and baked the dough. While assembling the two houses, I realized I probably should have copied a template off the internet rather than create my own. The pieces fit together fine for monkey boy's house. The problem rested in the aesthetics and the lack of dough for lil bug's house. Let's just say that it is a good thing I found a fantastic icing cement recipe which would hold the patchwork roof together on her house. Upon waking the next day, monkey boy was itching to decorate his house especially after glimpsing the assembled product on the dining room table in the morning. By 9 am the kids and I were decorating the houses and working on a mini-sugar buzz for ourselves. It was fun watching them decide how to decorate. Their stamina was limited as was my selection of candies. However for a 2 and 4.5 year old they did pretty good. This is what takes my breath away each and every day, whether I am driving, looking out our balcony window or going for a walk. These pictures were taken three weeks ago when the sky was clear. I took the kids for a walk to the open space (affectionately known as the field) behind our townhouse. By simply facing south and west, I was greeted by a spectacular view of the mountains. I can not grow weary of seeing them. The novelty remains and will continue to fascinate me. My monkey boy has even picked up on my awe and will often proclaim "I can see the Rocky Mountains, Momma, their beautiful!" If you look carefully, you can see Canada Olympic Park from our position in Calgary. I am slightly saddened that fall is quickly coming to a close. Halloween always marks the change for me. I love Halloween. Not the scary stuff mind you but the dressing up, the pretending, the excitement, the darkness and the mystery. Yet Halloween seems to herald winter into our lives. Don't get me wrong, on the whole I like winter. I love the first snowfall. I adore watching large flakes float down from the sky. I even like to shovel (though last winter wore me out). I like skating, making snow butterflies (monkey boy's one time term for snow angels), drinking hot chocolate, bundling up under blankets and feeling the peace that muffles the noises of the city. 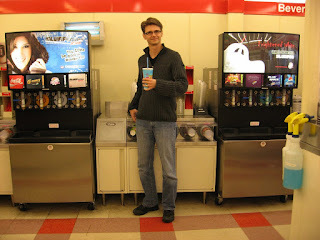 I just grow weary of the continual cold weather, the slogging through snow and ice to appointments, and the gray days. I hate gray days. I am looking forward to seeing how winter changes the hills and mountains around us. I delight in the idea of enduring a chinook wind (as long as I am safely off bridges) in order to receive a treat of warmer weather and clearer roads. I hope I can revel in an Alberta winter and have my children understand that sometimes you can actually see the ground for most of the winter months. My lil bug is fun, energetic and smart but her temper is almost too much to bear sometimes. Her frustration over not getting her way results in these fantastic emotional meltdowns. I will admit I am not as diligent or creative as I should be in handling these tantrums. Generally I keep her well-fed, well-rested, and active but my diversion techniques seem to always fall short. I attempt to let her exercise her independence by providing choice between limited options. Yet lil bug's verbal ability combined with her willpower means that she likes to refuse my choices and present another undesirable option. Sometimes I don't re-direct fast enough as I am occupied with her brother. Sometimes I do everything in my power and still a tantrum ensues. And boy do the meltdowns last long. For instance, supper last night meant having lil bug scream for 25 minutes and then she only ate five bites of rice before being excused from the table. I'm slowly learning that I need to let the temper episode take its course before I help her label her feelings and attempt to coerce her into appropriate behavior. Yet it is hard to remain patient and calm during the screaming and crying. I have resorted to removing her from the room just so I could regain my composure (though sometimes she thinks she wins as she doesn't have do to what I ask). I have even yelled at her and told her she was a bad girl. Lately I find that my sanity remains if I can just laugh at the absurdity of it all or capture it on camera. The camera is a wonderful tool that allows me to be just the observer and not a direct participant in the ordeal. Hopefully with time and consistency I can learn to work with these tantrums. Until then, who will "reign supreme" in the battle of wills? Stay tuned for the final verdict...someday in the very distant future. I did it. I volunteered in monkey boy's preschool class today. Curiosity was getting the better of me and overrode my hesitations about volunteering. It went really well. Monkey boy was glad to have me there. It was interesting to see how he is doing in this new situation, how he interacts with other children and what type of things they do with the children. The teacher is nice and well-educated. She genuinely cares for the students and attempts to provide learning opportunities based on their class themes. The assistants provide good role models, kindness and instruction/direction. I'm glad I went even if I was worried about interfering and had insisted on downplaying the value of this type of educational instruction (silly of me to feel this way but those feelings were there). The best part was my son sharing his favourite toy with the class. Each child's family takes a few turns in the year to provide snacks. On a child's snack day they become the special helper. They get to flick lights, lead groups to different rooms, and share with the class something special. Monkey boy shared his monkey with his class. This monkey is a stuffed pluffie toy by TY named Baby Clarence. I bought it for him when he was 6 months old and we were desperately working on his sleep habits (since he only slept in 45 minutes to 1.5 hours blocks and constantly needed the touch of his parents to return to sleep). He continues to sleep with Baby Clarence and uses him in lots of imaginative play. BTW I have 3 Baby Clarences in our house, though only one is in circulation and currently my son favours the original. I was very proud of my kid presenting a very personal and important toy in his life. He did not fear being teased or questioned for his choice of toy. He was so excited to share. The children asked some good questions and he answered in a very direct sweet way. This sharing moment made me realize he is going to be okay. He will grow to be a confident child and adult. He will not be ashamed of being affectionate. He will be willing to defend his choice. He loves his momma. And I love him. There will be more volunteer work in my future when it comes to my kids. I want to be a part of their ever-changing lives and to have them know I care and want to understand their world. I will try to worry less about my perception of things and just go with the flow (or so I hope). We spent most of the weekend at the farm. It was cold outside and very low key but it was a warm cozy weekend for me. I managed to find a few spare moments for myself. I worked a little on some knitting and whole lot on relaxing. The kids had different toys and people to entertain them. I had the luxury of making play dough without trying to do ten other things. I was even able to help out in the kitchen without children underfoot. My mom-in-law prepared terrific meals and had way too many goodies on hand (brownies and cinnamon buns found their way past my lips one too many times). We even squeezed in some family time with my side on Monday. I am having so much fun just watching my sister's and my kids spending time together. Jo and I were privileged enough to grow up knowing and enjoying the company of two very special cousins. The enchantment and nostalgia I feel towards my grandad's farm is intrinsically tied to the memories we created with M and G. It is nice to see our own children finding some unique special cousin moments themselves. My mom put on a wonderful meal (even if I had to tease her that it was all leftovers...she had cooked a ham on Saturday for her and dad and then put on a low key turkey dinner on Sunday for Jo and her family). Thanksgiving is such a great time to remember your blessings and treasures. I am truly thankful for family. I am thankful for this time we have together. I am thankful to be fully present in these moments. I'm not sure if I can stress this enough but, at all costs, I highly recommend staying inside when a windstorm blows through cowtown. Even if this means missing a child's naptime, dealing with irritable children and hanging out at Eau Claire Market (which has become a superb example of a city's failure to create a humming marketplace). If you fail to heed this warning, the following true story may be your own. On October 7th 2008, I woke to a beautiful day. The weather report predicted a warm, sunny fall day and indicated that cool weather and rain was due to arrive by the following morn. I decided we needed to enjoy the fresh air and sunshine while we could. So I threw the kids into the vehicle and off we went to Prince's Island. The playground was busy with a couple of daycare groups but the kids enjoyed themselves nonetheless. We meandered past a couple of art sculptures and dawdled by the lagoon watching the fountain and ducks. Monkey boy thought we should eat out for lunch. As I neglected to pack a lunch and the cupboard was bare at home, I acquiesced to monkey boy's request. We trudged over to Eau Claire Market discovered a neat indoor playground and found a meager and slightly unsatisfying lunch. The time on the parking meter was ticking down so we finally hustled out the door to make our way across the island and suspension bridge to the parking lot. When we entered the building the day was beautiful and we had all shed our coats, but when we left there was this huge dark cloud looming in the northwest sky. Monkey boy commented that a storm must be coming. I agreed but mentally "knew" it was most likely just a small rain storm passing through the city for the bad weather wasn't due to arrive until the next day...right?! Plus the weather report mustn't have changed as there were packs of people running, rollerblading or walking on their lunch break. We quickly made our way across the small island and were about to step on the bridge when the air temperature dropped. I told monkey boy to put on his fleecy coat while I donned mine. Lil bug was strapped into a cozy stroller and being in a typical 2 year old mode refused to put on a coat. I didn't have the patience to insist, so I jammed her coat and monkey's extra coat onto the top of the stroller. The kids wanted to throw the leaves we had collected earlier over the bridge edge but by now the wind had picked up and we had 5 minutes left on the meter. I insisted we hustle across the bridge along with the throng of runners. One third of the way across, the storm hit. You literally could see it hit us. The wind gusted and felt like a wall had hit us. The sky grew gray and dismal. Fellow bridge users were running at a funny angle and two roller bladers were clinging to the edge. Fear entered my soul. I had one hand clamped to the stroller and the other hand became a vice grip on monkey boy's wrist. In my calmest voice I told him we needed to run so we wouldn't get wet. Really all I cared about was getting the hell off the bridge. (Have I told you that I have a fear of falling into water, wild water like a river or ocean...this fear has gripped me in the past (walking a trail in Scotland and hiking parts of the West Coast Trail) but has never come to anything). We were about halfway across the part of the bridge spanning the river when monkey boy's coat flew off the stroller. My little worry wart son yelled that we had to get his coat. I stepped on it and bent down to retrieve it. It was then, I lost my grip on the stroller. It slammed into the guard rail. Thankfully this act only flung and pinned my daughter's coat into the fence. My panic level was escalating, my mind was racing about what to do. My son wanted to grap his sister's coat worrying that it was going to go into the water. My daughter started crying and wanted me to carry her. I couldn't take her out of the stroller and risk her flying out of my arms or not having a hand free for my son. I did not want to let go of my children. My hands were holding onto the lives of the two things most dear to me in the world. My body was being buffeted by the wind, my eyes only saw the river turning and rushing below. Strangers stepped into my little scene. A gentleman and lady shouted above the wind saying they had the boy's coat, monkey boy grabbed his sister's coat (fearing nothing but losing a coat), they helped me straighten the stroller and gave me the confidence to not only jam the jackets further into the stroller but to move from that spot. Another man asked if I was going his way and could he help me push the stroller. Unfortunately, I was racing the opposite way. We faced the wind together, bent ourselves forward and waded through the gusts to the end of the bridge. Away from the river, the wind was more manageable. We rushed to the vehicle just as the onslaught of rain arrived. I held my sobbing daughter in my arms before buckling her safely into her carseat. I hugged my son and told him he was brave and a very good helper. I sat behind the wheel of my car, a little shaky. We made it home. Later I found out the wind surprised almost everyone. The wind blew from 70 to 100 km/hr. It made the headlines for the day. You may think I am being melodramatic. Perhaps. Yet the fear was real. The events were surreal and shocking to me. I have experienced the power of Alberta winds in the past. I grew up in this delightful province. I have seen many chinook winds chase winter away from Calgary and surrounding areas. I even lived in the windy city of Alberta, Lethbridge, for close to a year and walked home fom the University of Lethbridge in a 100km wind gusts (I shaved 15 minutes off my walk that day). Yet I have never experienced a fright like this. I am glad to be a mother because it has put a different spin on life for me. 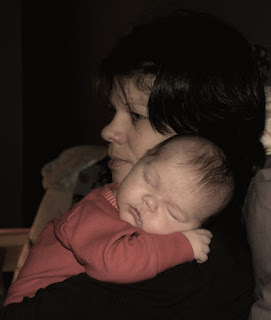 I am no longer the reckless crusader seeking self-gratification but a protector of her young. I'm a mother bear who will now avoid dark looming clouds and will deal with the inconvenience of restless, tired children for the sake of avoiding another storm. Fine weather once again prodded us into exploring our new/home province. We donned our tourist hats, buckled the wee people into the vehicle and headed west to the mountains. The breath-taking, majestic rocky mountains. Our destination were the hot springs in Banff National Park. I was inspired to see the Cave and Basin National Historic Site while watching an episode of "This is Emily Yeung" where she went to the hot springs. Now this may be a strange source for learning about tourist destinations but remember my days are filled with entertaining a 4.5 year old and almost 2 year old. This means that most of the dvds I sit down to watch are found in the children's section of our public library. I'm just thankful I am not looking for a way to visit Elmo on Sesame Street. We made our way to Banff Upper Hot Springs on Sulphur Mountain, bypassing the busy town of Banff and all the tourons shopping (a touron is a cross between a tourist and a moron, this term was created by some fellow exhibit interpreters when I worked at Heritage Park many moons ago). The kids were thrilled to be going swimming in a warm pool. Monkey boy's enthusiasm was infectious as he darted and charged his way up the short hill to the facility. We paid the admission price, wiggled into our swimsuits and headed for the pool. Initially I was a little disappointed by the small size of the pool and its upkeep (there were some parts in decay, poorly patched and blocked off) but that feeling floated away with steam. 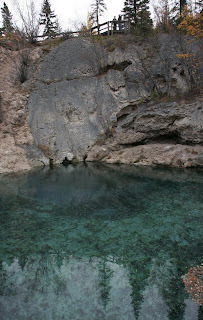 The air was cool and the mineral water temperature was 39 degrees celsius. It created a wonderful atmosphere of steamy air (even if it had a slight sulphur smell to it). It must be spectacular sitting in the hot springs pool while big snowflakes float down from the sky (hmm, maybe J and I could escape some weekend to Radium Hot Springs for some couple time this winter). Monkey boy fell in love with being in the warm water and having a sense of independence in the shallow areas. Lil bug clung to me without relent for about 15 minutes (personally, I loved ever minute of needing her momma). Eventually she relaxed, enjoyed splashing me and watching her legs float. After about 45 minutes of sitting and floating, we departed the luxury of the pool and left subdued, sporting lobster legs and aura of the fully relaxed (although for some reason my lil bug was strangely energized and very animated for the next couple of hours). We worked our way back around the mountain to the Cave and Basin Historic Site. We ate a small packed lunch supplemented with chips and a sandwich from the cafe kiosk before checking out the site. We ventured into the cave first. It was not a very far jaunt nor was it mysterious but it allowed us to smell the sulphur and see the original space that was discovered so long ago (and which initiated the start of our national park system). Monkey boy's attention span was limited. He just wanted to check out each place and then quickly move onto the next. This meant we didn't dawdle or check out every exhibit. However, we managed to enjoy seeing the place and foster his wonder in life. The basin is now a protected site for the Banff Springs snail. This snail only exists here. After carefully looking we managed to see a few snails. They are very small. So small that we were on our hands and knees peering over the boardwalk edge all the while trying not to touch or disturb the water. 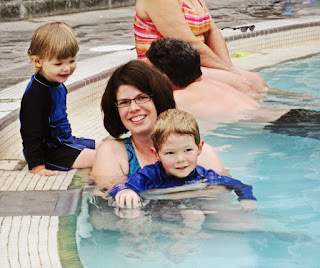 I think I was a little overzealous in my precaution and desire to follow the rules that I ended up becoming a bit tense during this section of our visit (despite my hot springs relaxation therapy) and was often halting the children's progress in leaning over the water. The water in the basin was amazing. The aqua colour was beautiful and even the algae growing in it had a sense of beauty to it. You could see right to the bottom and watch the bubbles burst from the earth and travel up to the top. It was absolutely fascinating seeing the earth fart. (BTW if you don't know already know, I think "farts" are hilarious. It is the one form of bathroom humour that still brings out the giggles). We ended our trip with a walk on the discovery trail. This boardwalk took us a short way up the mountain to see the top of the cave as well as the natural springs and waterflow around the area. It was such a pretty walk. The air was crisp and clear (though slightly sulphur-tinged), the colours were spectacular, and the place was quiet. We returned to the vehicle, tired but sated. After tanking up with coffee for J and a chai latte (my beverage weakness), we travelled home through the glorious mountains while the wee people slept. Our next adventure...unknown but perhaps "This is Emily Yeung" will inspire me again (or maybe I can look up something on the internet). I had a fabulous weekend at my sister's house. It is so nice to spend time with another mom, especially one who totally gets all my quirks and history (and likes me still). It was also nice to compare parenting notes. We both have two children, a girl and a boy, who have distinct personalities and we both find that keeping positive and energized isn't always easy or possible. I'm fortunate to have a sister who is so honest, funny and just plain loving. Thanks Jo for being you! Sharing time with Jo and her family means I am getting to know my niece and nephew more. It is taking me outside of my little narrow sphere of parenting and own children's interests and teaching me to be an aunt who is open to differences and new things. I'm learning a lot about superheroes but I think I have a long ways to go. We didn't manage to go far afield, just the backyard and the nearby parks (which btw are awesome) but we did squeeze in a girlie movie. After the weekend, I returned to my regular routine with the kids and J, i.e. wake-up, eat, go to preschool or a park, eat, put lil bug down for a nap, entertain monkey boy, snack, prepare supper, play outside, eat supper, go for walk and go to bed. As you may have noticed we need to eat...lots. Thankfully, J helps with the suppers (especially with the meal planning and grocery shopping) so that isn't so much a chore. The snacks and lunches are becoming a challenge. It is hard to be creative and healthy at the same time. Although, the wee people are traditionalists and seem to thrive on repetition, I'm getting bored. I grabbed a book from the library titled Lunch box : creative recipes for everyday lunches. I have yet to properly look through it and mark potentials. I hope it isn't just geared for adults or non-fussy eaters. The weather has been great here this week. This means getting outside and trying new parks is high on the list. I dragged the wee people to Prince's Island near downtown Calgary. It is a nice oasis with groomed lawns, lots of trees, an art walk, lagoon with fountain and quiet places. It also has a kickin' playground with Calgary themes interspersed into the structure. 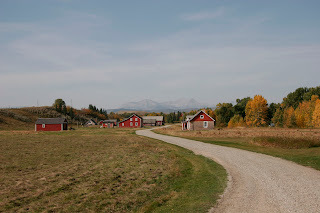 There is the Eau Claire Express train (three structures linked with slides and climbing areas and train facade), Fort Calgary (filled with climbing and slides), and Shakespeare in the Park kiosk to name a few. The kidlets loved it and wore themselves out. They also loved the suspension style bridge over the river and traffic lanes. It made me a little nervous seeing how willing they were to go near the edge to see the water flow. I try so hard to suppress my fears and not transmit them onto the kids but OMG we were on a bridge with water flowing under it. Pretty sight yes, but it filled me with a slight terror and angst alongside a non-stop visual of all the horrible what if scenarios I dreamed up. I didn't truly relax until we were safely going down the ramp on the other side of the bridge. It probably would have been less stressful if I hadn't encouraged a sense of wonder with throwing leaves into the water and watching them float down the river. Well another day awaits and I am not sure what to do with it. Hopefully inspiration will hit in the morning before I hear the 8:30am chant "what are we going to do today?" You know, I really shouldn't have used my weekly library visit on Tuesday night. A mere 10 minute drive away exists a respite for me. It is our local public library. It is a large one story building set on a hill (NW Calgary requires it of course). It overlooks a shopping district and more importantly a spectacular view of the mountains and COP (Calgary Olympic Park). The collection is large and current, the facility has comfy seating as well as kid-oriented tables along with easy access shelving plus there is a couple of preschool-aged computer work stations. The wee people love it. We seem to always leave the place with a canvas tote full of books and DVDs. I discovered today that it even offers some drop-in family storytime for 2-5 year olds (hmm, need to drag monkey boy and lil bug away from computer and into the story room for a half hour...sometimes). The wee people like to wander around the children's area looking for books. It is fun to see them excited about books. Lil bug focuses on "potty" books (a project we are introducing slowly) as well as boat and farm books. Monkey boy gravitates to anything with vehicles and occassionally throws in something else that catches his eyes. This library provides a necessary sanity break to my Thursdays, more importantly to my week at home. It allows us to venture away from our four walls and multitude of stairs to a safe environment. 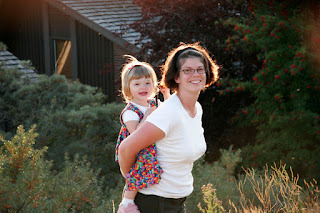 It is taking time for me to adjust to this full-time mothering gig. I like it but it is rather lonely and sometimes dull. Creativity in engaging the kids only comes to me in flitting moments. Plus finding venues to interact with other moms and toddler or preschoolers are few and far between unless you hang out at a mall, fork over cash for organized activities, or find the will power and interest to join mommy groups. So for now the library is going to be one of our favourite hang-outs. I like it there and I like finding books. Yah, I started to think we had entered the twilight zone of redneck land with this over the top beef industry propaganda. Fortunately, the beautiful ranch land and foothills in the background spoke to me. Landscape in my opinion can and will trump any human endeavour. Plus ultimately I do respect people who try to make their livelihood from the land. The ranch was lovely. It provided a taste of the "cowboy" life. Most of the buildings were restored and included some nice displays of artifacts and storyboards. No cattle on the grounds but a few horses were around. The ranch operated a wagon driven by the horses named "Hawkeye" and "Trapper" which appealed to J's and my nostalgia for the movie and tv show M.A.S.H. We more or less had the place to ourselves...definitely not a tourist trap on the day we were there. The grandparents loved snapping photos of the wee people and relaying their knowledge to them. There were fresh cookies at the ranch house, coffee from a pot over an open fire, a creek running through the property, horses to pat, and open space. Though the moutains were shrouded in haze, their presence was felt and added to the landscape in a remarkable way. Driving home was relaxing and entertaining. We passed a few miles of fench posts topped with baseball caps. Drove by a busy coffee shop, Navajo Mug, in Longview owned by Ian Tyson. We saw numerous bikers, both motor and pedal. As we moved from the south to the north, we moved through ranch land, forest, creeks. The wonderful space was fabulous eye candy and you can see why it is often used as a setting in movies like Unforgiven and Brokeback Mountain. 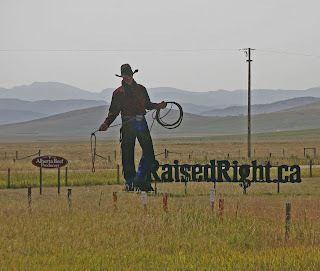 Heck, Alberta tourism even encourages visiting Kananaskis Country and Cowboy Country through their Reel Adventures road trips. Rest assured I will only take my tourist inclinations so far and will not become a "star" seeker. Honest! Warning: this is a long-winded post, peruse at your own risk. BTW most of my posts will be long-winded. It is just who I am. I am no longer ashamed of this fact but rather I embrace it. So enjoy as best as you can. Finally some computer time. J was discouraged when the first loaned computer had a motherboard problem. Thankfully, his folks have a number of used computers kicking about and he could mix and match some components and create a computer for us. So beyond having a lovely time at the farm (again) this weekend, we also scored a computer. With a functioning computer, I am now able download some pics from my camera and J's. All of the pictures (good and bad) reminded me how much we have done in such a short time. The trip to Shuswap Lake was good. The wee people connected with their cousins, grandparents, aunt and uncle. Monkey boy marvelled at the wit, strength and charm of his uncle and tried to keep pace with his older cousin. Lil bug took a long time to warm up to anyone but grandad and her eldest cousin and became quite the momma's girl. She shied from her auntie but eventually warmed up to her, sort-of. The drive to the resort was straight-forward but looong. Sitting in my parent's truck between my two kids in the back seat grew a little tiresome. 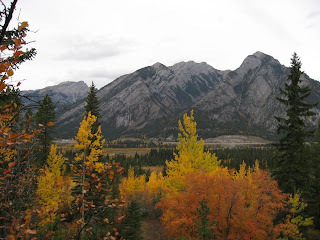 By the time we reached our destination (over 9 hours after leaving Calgary), I was hungry, feeling out of control and tired of monitoring the behaviour of two wee people (which other than the last 15 minutes was pretty amazing). As a result I unfortunately blew up at one of the people I hold dearest to my heart, my mom. She confronted my attitude a bit, gave me space and reminded me she understood and wasn't mad. I hope I have apologized to her appropriately. Why oh why do we revert back to our teen personas when we are around our parents. I wasn't wild about my teen self and I definitely want to shed the insecurity and defiance I held towards my parents during those years. Hindsight is always 20/20. Thus whenever possible I will try to check my defensiveness at the door, I will insure I ingest healthy food regularily, and I will try to remember that being grumpy is not to my benefit. I sure hope I can remember these important life tips. Other than the drive, our vacation at the resort went very well. Our time was taken up with the kids but with their ages (all 5 and under) we knew that this would be the case. My wee people enjoyed the creek, rocky beach, lake and small playground area. Alot of time was spent sending boats down the creek to the lake, throwing rocks, hauling water from the lake to the water hole on the beach, going for walks and following the wee people on their bikes and scooters down a paved road. We managed to dine outside all but one night. We crowded around two picnic tables with wine and food. When the wee people finished eating, they moved to the play structure while we finished our meal. Truly a civilized way of vacationing especially considering my mom took the responsibility of preparing the majority of the week's evening meals. Some early evenings included a rousing game of hide n sneak (as monkey boy calls it). This really should be a straight-forward, risk-free child's game. Not so with me. What happened was this: I was it (along with lil bug who was in my arms due to being shy), I counted, everyone hid, I went searching for people...sounds normal right except...I chased people to the home free rock and I tumbled. Yup with child in arms I chose to run up a set of stairs to catch someone before they were home free and I wiped out. I saved the kid...not a bruise to be found on her but my hand and knee took the brunt of my pleasure in play (and my slightly competitive nature). Check out the picture. 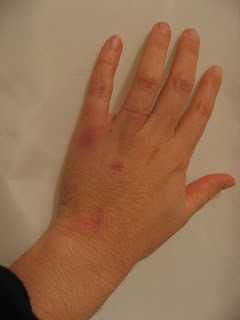 This is a few days after said accident but it shows the damage of playing without good shoes on or arms free. 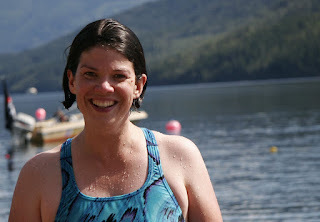 One thing I managed to do for myself on the vacation was swim in the lake. I love water. I love feeling water surround and buoy my body to the surface. The lake was cold and the ground was rocky but I put on a pair of sandals, waded a bit and plunged in. It was divine. 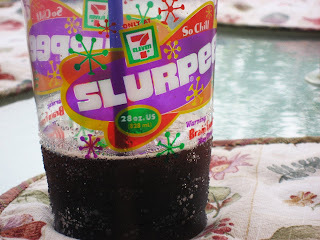 I partook in this secret pleasure twice. The second time was slightly warmer and I managed to submerge my whole self without having to resort to those OMG it is sooo cold shrieks. J drove out half way through the holiday and I was glad he made it. Plus we got to break in our new vehicle (2008 Toyota Rav4, sport model) by driving it home through the mountains. The trip home was less stressful as we were returning to the known. I enjoyed being in the moutains. I forgot how when you were really close to them, their magnitude diminishes. I was disappointed around Golden and Field and surprised by my reaction to being close to Rocky Mountains. Yet as we approached and passed Lake Louise, Banff and Canmore, I again marveled at the magnificent beauty that nature has created from valleys, rocks, trees and rivers. The river had that unmistakable emerald blue, the sun shined brightly from behind us and the storm clouds dissipated as we rode on the highway in the valley amongst the mountains. We didn't see any animals along the way other than the birds, insects and a chipmunk but it was nature nonetheless that I enjoyed is so much more than humankind's imprint on the terrain. Well that is my vacation recap. Now for current news. The weather has improved around here. Positively wonderful to be honest. It has been plus 26 celsius the last two days. I managed to drag the wee people to the community centre playground yesterday. It proved to be a longer walk home due to exhaustion, heat, water pit stops and the bloody hill. Calgary's NW seems to be built on hills. This makes for breath-taking views but gives the old out of shape body a major workout (picture of our view from the hill in the field behind our house will be posted someday cuz it will make yah jealous). 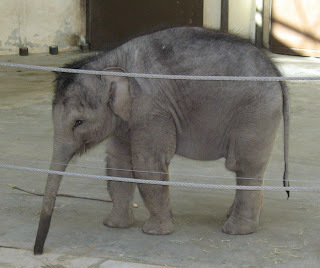 To further take advantage of the fine weather, I went to the zoo today with my mom and the wee people. The Calgary zoo was a blast. Monkey boy enjoyed running, listening to the recorded messages about animals and seeing the baby giraffe while lil bug found the ducks roaming free and the baby elephant to be the highlights of her day. It was a great way to spend the day. Tomorrow will hopefully hold good times as well. I've been struggling to form a routine and rhythm to the day that the kids and I can live with and hopefully thrive in. Monkey boy seems to like preschool but is having a hard time with drop-offs. I really hate leaving him there when he is on the verge of tears. Transition and change...not the best thing for him. At least, I feel like monkey boy and I are finding ways of bonding. He seems to love the quiet play we have when lil bug is sleeping and we pretend his stuffed animals want to have sleepovers and playdates. My lil bug is a challenge lately. I truly adore her, her physical and verbal abilities and her strong independent nature. She loves to tell stories, sing songs, recap her days, play pretend, try to use the potty and get dressed or undressed almost by herself. However her emotions run rampant. She can be sweet and pleasant then a tornado of sadness, anger and indignation (often because I need her to get dressed and I offered the wrong choice of clothes, i.e. they weren't pink in colour, where did this fashion diva come from...definitely not me). I need to find a way to deal with her outbursts and her complete meltdowns. I can only handle so much crying, whining and floor slithering. Yet, how can I remain frustrated when she perches on my back, takes hold of the ties of my headband and repeats (ad nauseum) giddy up horsie. We are in our rental place. It is nice and fairly spacious for a townhouse with lots of stairs. The wee people are settling in. They are discovering new and annoying things to try...such as flicking lights and fans on and off repetitively because they are flat switches located very low on the wall. My sister and her friends spoiled us by supplying a couple bins of toys for the wee people. Monkey boy and lil bug loving delving into them and playing with the farm, castle, ice cream shop and cars. Big thanks to them. My in-laws brought a computer up for us to use yesterday. However, we need to find some kind of desk before we can set it up and I can finally download some pictures into it. I miss playing with photos. I didn't realize how much I enjoy telling a story by referencing to a picture, how much I want to use pictures to capture moments and feelings and how much I want to improve my photo skills (composition and technique). This realization is definitely fueling my desire to take my love of photography and digital photo-processing and develop it into a useful skill. Monkey boy started preschool on Monday. It is 3 times a week for 2 hours in the morning. As with anything new, he greeted the change with apprehension and limited excitement. I think it will prove a useful exercise in the long term as it will allow him to continue to develop his social skills, learn some basics and keep him in the educational loop since he is missing jr. kindergarten in Ottawa. The preschool seems well set-up, his educator is nice and omg I have to do volunteer work. Yup I signed up to help with the scrapbooking project plus I will have to supply snacks once and awhile and assist in the classroom on occassion. I'm not sure if I am ready to embrace the social aspect of parenting. In theory I enjoy interacting with people and participating. I often thrive on it. However, I too can be apprehensive or worry too much about how others perceive me, especially when I think the other moms already know each other and have solid friendships or acquaintances. Also I find as I age and become a mother bear in some instances, I am more selective in the friendships I develop and tend to only seek satisfying interactions with like minded individuals. I wonder if these moms will be like-minded especially in light of the fact that many seem to take this preschool business pretty seriously. There were a few parents who had dressed the kids up and were taken multitude of pictures as they entered the community centre and classrooms. I didn't think a two hour program 3 times a week meant first day of school. Yah it is exciting and a big experience but really now. Or perhaps I should be feeling guilty for not taking monkey boy's picture. Today is a day off from commitments. I brought the kids over to the parentals so I could blog and steal a library card. Now we are off to the library and hopefully some groceries. I hope it is a day without frustrations (for the wee people and me too). We have returned from our week long trip to St. Ives Resort on the Shuswap. As I am tired and completely unable to spell let alone form a coherent thought, I am only leaving these point form notes as a teaser (and reminder for me). Packing is done, boxes have been shipped and our personal belongings have been organized and stored in our house. The 4 hour flight with the wee people went fantastic. I received multiple compliments from the airline crew about how well the kids managed the flight. The shocker was that they attributed their good behavior partially due to my being so relaxed and calm. Wow, this must be one of the first times I've ever heard I was relaxed and calm. Normally I need to be fussing about something, organizing something else or hovering over people. Hmm, maybe heading west for a sabbatical from regular life is going to be a very, very good thing. I'm slowly starting to settle in. It feels like we are on a holiday but not a holiday. I think I just need to resign myself to being a suitcase dweller for another 10 days, consider it a holiday and then worry about settling into Calgary living and our rental place. My folks have been spoiling us with a stocked fridge, home cooked meals, and absolutely nothing to clean or fix. They have also provided some valuable entertainment for the wee people. This means J and I have had some time to converse without interruption (very useful since we have decided to buy a new vehicle after selling our other two before we moved...which is proving to be very time consuming and taxing mentally and emotionally). Currently we are spending a day and a bit at J's folks. They live on a farm in Southern Alberta. I love visiting this place! It truly is a different pace of life. J's folks love spending time with the kids and just don't fuss in the same way my mom, dad and I do (a good and necessary change once and awhile). Food is put on the table, people occasionally drop in, sometimes you need to run into town for supplies or to visit but these errands become an event. For instance, Grandpa took monkey boy into town (15 min drive) to drop garbage off at the dump, see Gr. Grandma for coffee at the DQ (don't ask long story, small town), buy some groceries and get a new life jacket for monkey boy. Grandma is outside entertaining our lil bug and I am sitting here, typing, listening to the wind and breathing, just breathing. 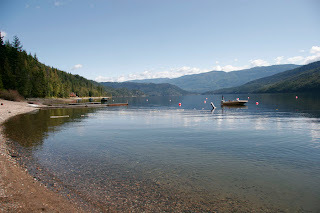 Next adventure, cottage resort time at Shuswap Lake in British Columbia. Long drive but family time for us, my folks, and my sister and her family. I'm so excited! I'm procastinating. Big surprise. In just over 10 days, we are temporarily displacing ourselves. We are taking a few possessions (okay, more boxes of stuff than my idealistic "live simple" self should take for a 10 month sojourn), renting a furnished condo, and hauling ourselves and our two wee people away from the nation's capital. We are journeying back to our home province, to where the prairies meet the mountains. My partner, J, will have a chance to spend his sabbatical year immersed in writing and we will both have a chance to enjoy our children with our families. It should be a great "adventure" away from regular life. We have an opportunity to explore our home province as tourists. We have grandparents to help with the kids (babysitters = couple as well as me time). It will be great. I should be packing! !